The 525 Town Lake 2 bedroom, 2.5 bath urban community offers the discerning tenant something totally unique in Downtown Tempe — walkability with some of the luxuries of a single family home. The gated community delivers with a 2 car tandem garage, multiple patios, a swimming pool with cabanas, jacuzzi, a barbecue area and even a dog run. Enjoy all the luxurious conveniences of a large home while still being urban. 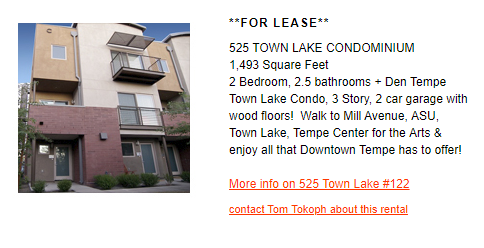 Walk to Tempe Town Lake (out your front door), walk to Mill Avenue (a mere block or 2 away), 525 Town Lake will be a perfect fit for the excitement and eclectic appeal of downtown Tempe and the bustling ASU campus. If you lead an active life that thrives on spontaneity and endless variety, 525 will be your headquarters for stepping out and satisfying your appetite for life. Call 602.549.9000 or email for current pricing. Are you tired of juggling your property management duties with your full time job? Do you need a broker to help you find qualified and reliable tenants? 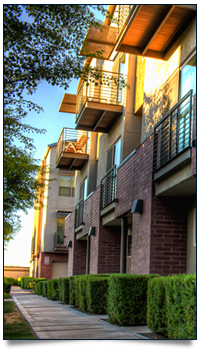 Are you looking for a property manager to help make managing your 525 Town Lake property easy? With over 15 years of property management experience — we’re here to help! Contact us (use the form to the right) to find out more information about our Property Management Services.